I’ll admit that I’m not the most organized person. I work in public relations which means my desk is always full of extra pens, pads, pieces of paper with notes on it and various other trinkets. My desk gets very messy very fast and that is a problem for me. I’m happy that my desk is finally not the messiest one in the office thanks to Bostitch! Bostitch Konnect Desk Organizer has made my day to day activities at my desk so much easier. I received their 12-piece Konnect Desk Organizer and Cable Management Kit. My desk used to look like a tornado went through it and now it’s nothing short of clean and tidy! Below is everything that you get when you order the 12-piece Konnect Desk Organizer + Cable Management Kit. It also comes in four colors. I got the white one to match the rest of the soft setting that my office has but it also comes in black, gray and blue. What I love so much about my new desk organizer also is the customization of it. The way they are designed allow you to mix and match the order effortlessly. They easily slide right onto the management rails. The rails also come a variety of sizes and combine with the corner connector you can easily adjust them to any desk, any size, anywhere! Whether it’s your desk at home or in your office at work, they work great. To make it even more easy to use is that the set comes with various pieces that allow you to screw them into the wall, sit on the desk, connect to a slat wall or even hang over a cubicle. You can use these virtually anywhere! The thing I also like about all these various pieces is most of them are multipurpose. Some of them are designed one for one thing but you can easily use it for another. For example, I actually started using the note pad section for my business cards. My two favorite pieces are the USB phone dock and the power hub. I’m a bit of a tech nerd which means I often forget to charge things. I have my personal cell phone, my work cell, an iPad and an Apple watch. Having all of these allows me to charge which ever one I want, or even all of them at the same time. And the cord management rails make it so that all the cords don’t messy up my desk either. You can order your very own Bostitch 12-piece Konnect Desk Organizer and Cable Management Kit online. When you order, you can use the promo code BRETTBURGER for a whomping 30%! 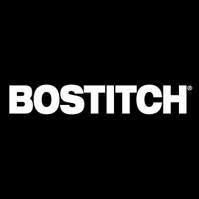 You can click the DealSpotr button below to go to their page and locate the mots updated list of deals for Bostitch. Don’t forget to use my code BRETTBURGER. Bostitch sponsored this post. Although I received free product, all opinions are my own.